Now wasn’t this the best collection of short stories I’ve read in awhile? I greatly enjoyed these stories! I hit a pretty good roll on my reading when I started Music for Wartime and it’s a nice treat to keep the good reads rolling. Now, some of you may remember the issues I had with Makkai’s The Borrower, the one that opened strongly but then frustrated me by the end. Because of this, the copy I have of The Hundred Year House by Makkai, has been languishing on my shelf. While the premise of Hundred Year House always sounded intriguing, I was holding off in reading it due to my feelings for The Borrower. Well, now that I’ve finished Music for Wartime, I can put any and all hesitation aside about reading this and will be picking it up sooner rather than later. At any rate, my love for the stories in Music for Wartime was pretty immediate. Makkai opens the collection with a short and sweet one and a half page story entitled, “The Singing Women”. It set the tone perfectly for the title of the collection and I eagerly read on. The next one, “The Worst You Ever Feel” again sets a solid tone for about wartime stories, or the stuff found in fables and legends in wartime stories. It does take a great switch over into a more modern style story after the first two, but “The November Story” was still very compelling one and gives a look behind the scenes on those reality TV shows – how they are scripted and manipulated. It was a very enjoyable story – a standout in the collection for certain. Really enjoyed this story. We were on a definite roll here! Reading on! Then we came to “The Miracle Years of Little Fork”. Excuse me while I bold that tile because this here was my very favourite – this was a 5-star story for me. I still think of it and just loved it dearly. For some reason, and I’m not sure if it’s the right book to compare it to, but for some reason it completely reminded me of Tiffany Baker’s The Little Giant of Aberdeen County. It had just that right mix of magical realism combined with fantastic characters, and is about a story of a circus that comes to town and the impact on the town resulting from the elephant’s death. I could have read “The Miracle Years of Little Fork” forever! The second runner up (or ups possibly) for the best stories (for me) were: “The Museum of the Dearly Departed” and “Cross”. Oh, even “Painted Ocean, Painted Ship” was a very good one too! See what I’m saying here? This was a rock-solid collection and there came a point where all I wanted to do was continue reading through the stories, I did need sleep though and was forced to put them down, but to be honest, I could have easily read this collection in one giant gulp. Even the quite short “Legend” stories – which were to be taken as a somewhat autobiographical peek into Makkai’s family history – were all wonderful to read. They were like little jolts of folklore that bind so many family histories together, they were each a joy to read. Even when I got to the Acknowledgements section, I eagerly read through those as well! This was because Makkai took the time to thank each of those that helped edit the stories, choose the stories and make the collection what it was. And what this collection was…it was truly fantastic reading! Thank you to Viking for sending this collection our way. Mucho appreciated! 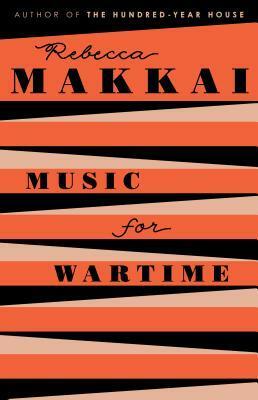 Book Riot lists Music for Wartime in their Best Books of 2015 So Far, with Rebecca Schinsky stating, “The stories are haunting and enchanting, wonderfully strange, and unforgettably gorgeous.” I couldn’t agree more. If you’ve hesitated in reading short stories before, I might point you to Music for Wartime to work from as a starting point – I think you’ll find this collection has a nice blend of the very short (only about 2 pages in length) to the stories that are much longer in length, giving you the sense of reading a longer story – if that makes any sense.